One More Week for Grossness! Greetings, guys, and fans of grossness everywhere! 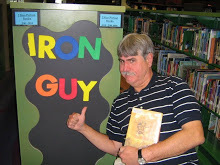 (and "guys" and "fans of grossness" usually mean the same thing) The Iron Guy likes to use this blog to spread the word about terrific books but this time he's going to let you all know about a truly cool display here at the Myers Park library, the Iron Guy's home base. One of our librarians who specializes in grownup books took a grownup display area to make something that GUYS would appreciate. 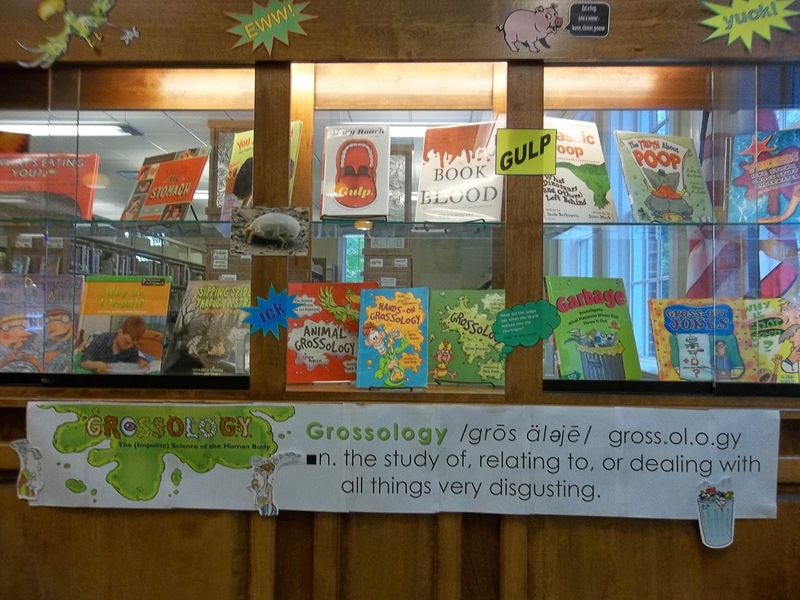 It's-----GROSSOLOGY! 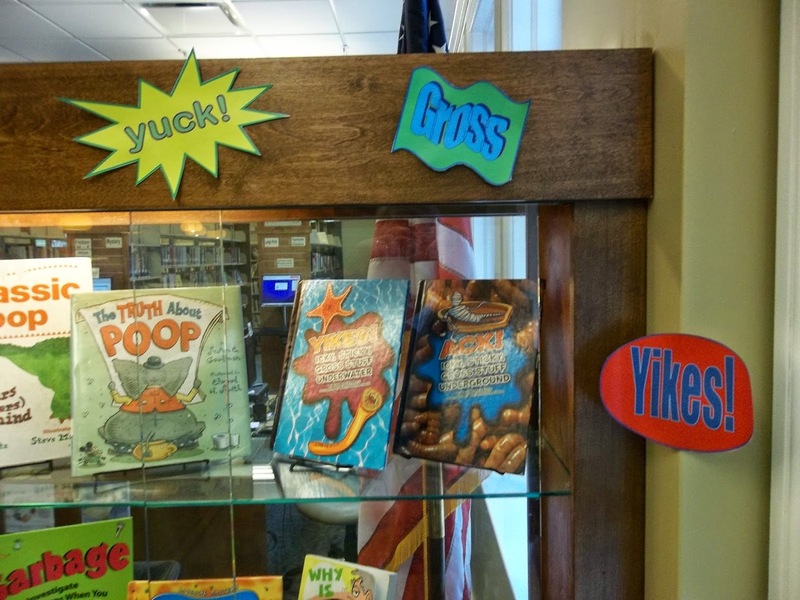 Yes, this whole display is devoted to books about all things vile and disgusting. In other words, stuff that GUYS would want to read about! But there's one catch--this display will be up for only one more week. Yes, I know, that's not much time. My bad! But if you can get here before next Thursday, these shelves will still be full of icky stuff--I mean, books about icky stuff. Now, some of these books have been checked out since this picture was taken but don't worry--they have been replaced with plenty more! So come on over and get them before they're cleaned out. Hey--I just made a joke--gross stuff; cleaned out!!! Hahahahahaha!!! 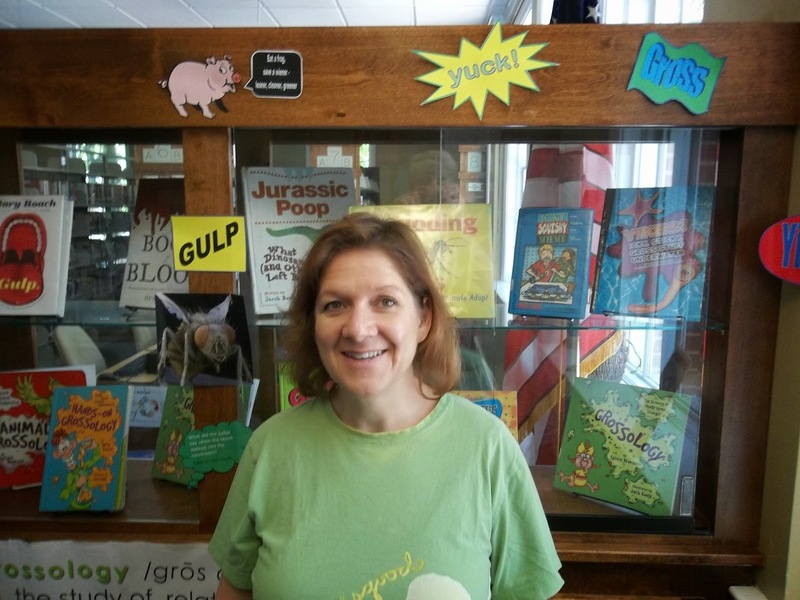 By the way, here's a shout out to Carolyn, the librarian who thought of this display. The Crazy Case of Missing Thunder by the wonderful Tony Abbott. It's the first of the Goofballs mystery series and how could you not love a series called Goofballs? and how do you know if you're a Goofball? If you stick french fries in your nose and ears, run over to your friend's house in your underwear or squirt cheese at each other. And that's just waht Jeff, Mara, Brian and Kelly do. They also love to solve mysteries, so when Randall Crandall, the richest kid in town, loses his horse, he naturally calls on the Goofballs. But how do you find a missing horse? And what's the connection with the flower shop and the Pizza Disaster? This is a fun read and a good introduction for younger reader guys to mysteries. A volcano threatens to erupt and destroy a tropical resort island. The Flash knows only one person who could help--the infamous villain Captain Cold. The Flash appeals to Captain cold's vanity--the villain could get lots of glory for saving the island. Captain Cold agrees and together they work to stop the eruption. Or do they? Can a villain ever be trusted? Just as Hal Jordan, lies down on a hammock for a much-needed vacation (saving the universe all the time is hard work), his Lantern ring sends out a message for a new mission--the deadly Manhunter robots are attacking a human city on Nokyo One and Hal is the closest Green Lantern. So he sets off, finds the Manhunters and gets into an epic battle, only to have his ring's power level go down to one percent. Then, suddenly--no, I won' tell you! You'll have to read it for yourself. Ha, ha!! Bet you'll find it now! Both of these books had lots of action and the stories moved right along. And the illustrations arew good and there are places with real graphic-novel style lettering. A good cross between a chapter book and a graphic novel. It's not unusual for Nick and Maxine to live in "A tall building, with one apartment stacked on top of another," but it is unusual to for Maxine to stand with her head in a corner and see a "little old-fashioned house" in a whole street of tall apartment buildings. It's even more unusual for that house to have a cat as a butler! And wait until you see how they make cookies in that house! This is a really cute story. Now truly MANLY MEN don't usually do cute but this book also has Daniel Pinkwater's offbeat sense of humor--just wait until you meet the far-sighted mice! I enjoyed it a lot and can't wait to get the next one, Mrs. Noodlekugel and the Four Blind Mice. All right, guys, go check these out for younger younger brothers and cousins and friends. Who knows--you might like them too!